For no particular reason, I felt like taking my donut pan for a spin. I've been wanting to make a banana bread-like version so I did just that. On the eve of all the July 4th festivities to come, I thought these would make a quick breakfast in the morning (not to mention a good snack today) before we head out tomorrow for some fun. These are simple baked banana donuts. I started with this recipe but made a few tweaks. I used a mix of all-purpose and whole wheat pastry flour, added ground ginger (because that's what I put in our favorite banana bread), and some mini chocolate chips. I topped it with our usual, quick and easy, chocolate glaze. It's all very easy and rather fun at that. A donut pan gives us the option to eat our favorite treats in a different way. I made use of the buttermilk in my fridge for this recipe. I was a little concerned that there's no oil or butter in this donut batter but they turned out moist and flavorful so no worries afterall. Most baked donut recipes, like this one, will leave you with a little bit of extra batter. I filled my six donut molds and, with the rest of the batter, I made a few mini muffins. They're almost like little donut holes. Given it's the 4th of July tomorrow, I made use of the appropriate sprinkles for the occasion. Here's to kicking off the holiday weekend! Silly enough, I was thinking about which side of the baked donut to glaze. I've been doing the opposite of what I think most people do - dipping them on their tops, the wide or lumpy side. So I thought I'd flip them this time and try dipping the donuts on the smooth bottoms. From what I can tell, there honestly isn't all that big a difference between dipping either side of the donut. Just glaze 'em! You could really have fun with it; I keep thinking about fun glazes like peanut butter, coffee, and strawberry flavors but end up sticking with the ever simple confectioners' sugar/cocoa glaze that my little one favors. So you know what? 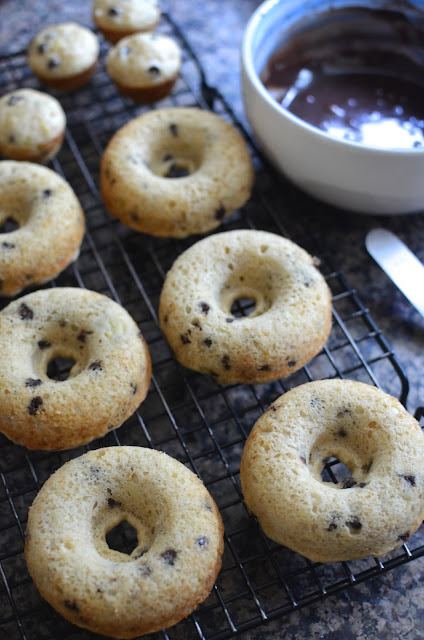 These little banana chocolate chip donuts taste like a slightly bouncier version of banana bread in ring/donut form. That's cool in my book. In a large bowl, whisk together the flours, salt, and ground ginger. Add chocolate chips and whisk to combine. In a medium-bowl, whisk together the sugar, egg, bananas, buttermilk, and vanilla extract. Make a well in the center of the dry ingredients. Add wet ingredients into dry and stir until just combined. Fill donut pan with the batter (I use 2 spoons), about three-quarters of the way full for each. Bake for approximately 8-10 minutes, or until a cake tester inserted into each comes out clean (check early and avoid over-baking). Let donuts cool in pan for about 5 minutes before turning out to cool completely on a cooling rack. Dip donuts with glaze and decorate with sprinkles, if desired. For glaze: Sift powdered sugar and cocoa powder into a medium bowl. Start by adding 1 1/2 tablespoons milk and the vanilla extract. Whisk together. Add more milk, as needed, to make a thick but still fluid/pourable glaze. Dip fully cooled donuts in the glaze, smooth side down (but either side is fine). Set on a wire rack and add sprinkles, if using (don't wait too long to do this since glaze will begin to set). Let glaze set fully before serving. We gotta take that donut pan out once in a while and use it! : ) Donuts are just so fun and cute for whatever reason. : ) Weekend was great - hope yours was, too! 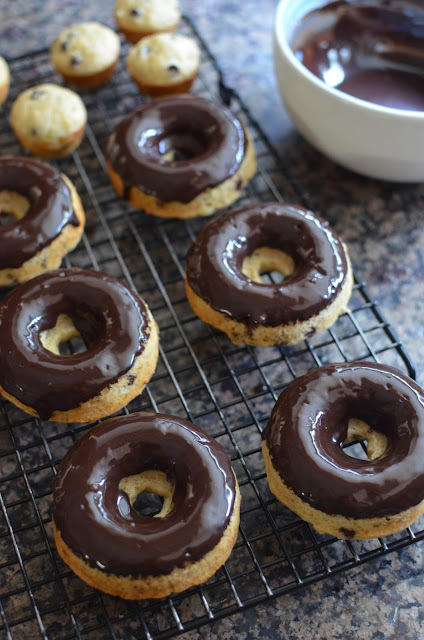 I have a donut baking pan in my cupboard and I really need to dig that out as this recipe is calling me. Love chocolate and bananas together. Wishing your family a super weekend! I should use my donut pan more often! These look beautiful! I'm sure you'd make some great varieties! Thanks! Just need some excuse to use that donut pan and a banana-chocolate totally works in my house. Hope you had a great 4th! Happy 4th Monica, love that you made banana chocolate chip muffins. I keep forgetting about my donut pan. Donuts always make events a little more special. It is definitely fun in ring form and just handheld! Thanks, Medha. No excuses needed to make donuts, in my opinion! Especially not when they're as cute as these are! Simply damn delicious morning supper donuts. We're "resting" after the festivities from the 4th. Have a great week and thank you! Made a quick breakfast, thank you! I can see why your son would love this glaze, Monica! So dark and chocolaty. What a wonderful topping for banana bread or banana bread doughnuts! I have never thought of putting ginger in banana bread.Our favorite has only cinnamon and vanilla, but now I can't stop thinking about how good ginger sounds combined with banana. I will try it the next time I bake a loaf! The banana bread recipe we love (from Molly/Orangette) comes from her first book and in it, she used crystallized ginger. I wasn't so into that so I switched to ground ginger. I've tried it with other spices like cinnamon instead and for some reason, I feel like I like the ginger best. To be honest, I'm not altogether sure you can taste the ground ginger that much but I like it and it's become a habit. Cool indeed! 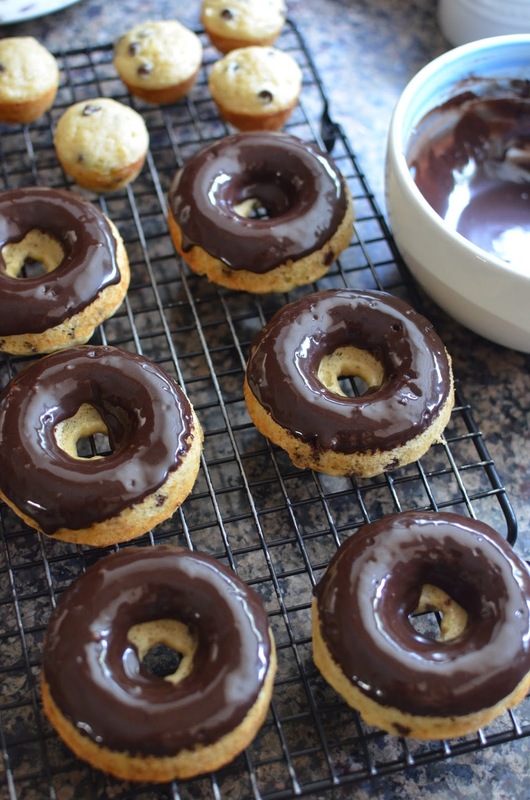 This would be a hit in my house.I love the intense dark colour of the glaze..makes the doughnuts all the more desirable.I also love baked goods that can use up my sprinkles. Now I don't know which one to make first..these doughnuts or the cream cakes! I always crave and have chocolate so I know how it goes! ; ) I probably need someone to take some of these treats off my hands so you'd be a handy neighbor.